Washing the jar, lid, and ring — As with all preserving techniques, containers must be thoroughly clean. Thus, run the glass jar through the dishwasher. Meanwhile, sterilize lid and ring in a saucepot of boiling water for 5 minutes. Preparing the cucumbers — You can preserve the cucumbers whole, or slice them into spears. For spears, quarter each cucumber lengthwise. Slice off tops and bottoms, too, if you wish. Making the brine — In the large pot, bring water to a boil. Remove from heat, and add vinegar and salt. Briefly stir with a wooden spoon to dissolve the salt. Allow this brine to cool to room temperature. 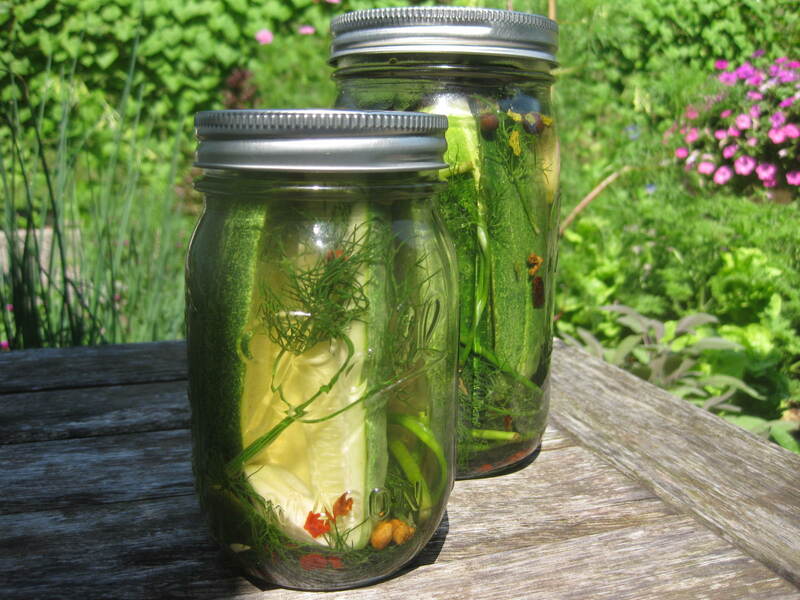 Filling the jar — Place a handful of dill in the bottom of the jar, and pack with cucumbers. Tuck in garlic cloves, add the tablespoon of pickling spice, and, if you wish, more fresh sprigs of dill. Then fill to within a quarter-inch of the top with the brine solution. Cover jar with its lid and ring. Refrigerating – Set the pickles in your refrigerator, and do not touch them for at least 2 days, if not a week. During this time the cucumbers will transform themselves into pickles — crisp to the teeth, and richly infused with garlic and dill, and also the clove, tumeric, bay, and other flavors of the pickling spice. Storage — Pickles will “keep” for up to two months in the refrigerator. Now, my Refrigerator Pickles use only minimal ingredients. You might like a more sophisticated, customized blend. Consider adding to the jar a pinch of red pepper flakes…thin slices of onion…freshly-snipped chives…really, anything you can think of that will enhance your own pickle-pleasure. I make refrigerator pickles every summer, using apple cider vinegar and a pinch of sugar (I like my pickles a little sweet). I've never sterilized the lids and rings of jars. Is this bad? Gregory – Since you are not canning the cukes for indefinite room-temperature storage, you probably don't have to sterilize containers. I'm just fussy! Is it ok to use old fashioned glass jars with clamp-on lids? I don't know how tight the seal is. Phoebe – You can absolutely use your wonderful old-fashioned jars for these pickles. They don't require a perfectly tight seal (as with canned produce)because they are cold-processed in the refrigerator. 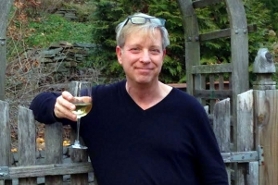 Katreader – Great article and recipe — does the seeded rye bread contribute flavor – or does it affect the brine somehow? Concerning the dill dilemma, I'm with you. We plant it way too early, and then it's finished long before the first cukes are ready for harvest. Even my farm store was out of dill. The supermarket came to the rescue. Anyway, I sowed more cucumbers yesterday ('Picklebush'); next week I'll sow more dill. I just made your pickles, Kevin! And like Tom Petty once sang, “the waiting is the hardest part.” After an hour I opened the jar and it smelled like heaven: redolent of dill, garlic and cloves! I don't think I can leave cukes alone for 2 days, let alone a whole week!!! 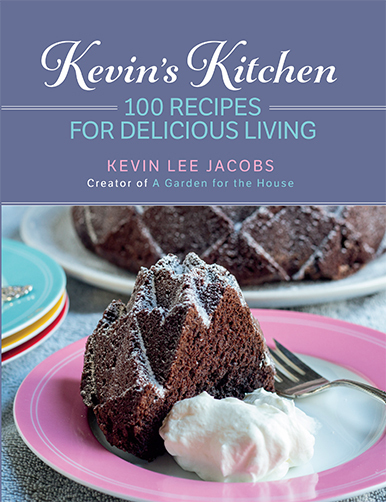 Kevin, great recipe. I have long, “burpless” cucumbers in the garden. Can they be turned into pickles? Adele – I know what you mean about waiting. I keep opening my jars, too. The scent alone makes my mouth water! 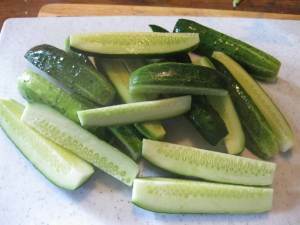 Eric – You can pickle large, hybrid cukes, but they won't be so crispy as the small, pickling types. These recipes of yours make my mouth water. Perhaps a Garden in the House cookbook is in the offiing? Yum! Kevin, two days ago I bought kirby cukes from the supermarket, and then made your pickles…3 jars worth. I'm going to make more. They are BEYOND FANTASTIC. I sent the recipe to my mom. I asked my folks about the reason for the seeded rye bread…we all come to the same conclusion, “that's the way Aunt Emily did it, so that's the way we do it”. My mom thinks it's mainly the caraway seeds giving flavor-but we don't know that the bread doesn't do something as well. Once the first batch of pickles is consumed, can we use the same brine and put in a fresh batch of cukes? Love Love the Super Easy Refrigerator Pickles and my pregnant daughter devours them!! Needed to grow more cucumbers!